Time for Climate change action! Kevin Rudd's 5% reduction targets are not enough, and Australia's worst polluters should stop getting obscene subsidies from Australian taxpayers! 20 February 2009: Australia takes its sun for granted - How Australia ignores its abundant sun and its energy contribution to a post-carbon society. An investigation into the Australian government's avoidance to use its main asset, the sun, and how it could power much, if not all of Australia's energy needs. Australia is not just avoiding its role in building a post-carbon economy, but more disturbingly, that it keeps itself beholden to the lobbying powers of the polluting industries that use coal as its core energy source. 19 February 2009: Black Saturday 2009: Reflections after the Victorian Fires - "It's possible some people may feel upset by the link being made in the media here and overseas between bushfires and climate change. I understand that people are shocked with grief. But there are many things we can and must learn from this tragedy, and one of them is this: The climate has changed. Our 5 per cent by 2020 carbon pollution reduction target is no longer politically viable. We are facing a climate emergency and [are] running out of time." 8 January 2009: Climate Troubles: the condemnation of Australia's Climate targets - The Rudd government's 'softly-softly' 5% targets have been roundly condemned by NGO's, climate scientists - and also by Ross Garnaut, Australia's climate change consultant, who was commissioned to write the papers, and now the head of NASA's Goddard Institute for Space Studies, Professor James Hansen, has written an open letter to Barack Obama about Kevin Rudd and Penny Wong's targets. 22 April 2008: The 2020 Summit: Coal Industry Chiefs overheat Kevin's Climate - "I found myself in the climate stream with representatives of coal mining companies including Xstrata and Shell, yet not a single person from an environment Non-Government Organisation. No-one from Friends of the Earth, the Australian Conservation Foundation, Greenpeace, Climate Action Network Australia or any of the State Conservation Councils." How does the letter campaign work? 1. If you want to send all issues raised, just enter your details in the top section, then make any or no comments under each paragraph, and click the "Send the Letter!" button below the contents of the form. 2. If you would like to skip a paragraphed topic in its entirety, change the little round 'yes-no' button (called a "radio button") to "no, only my comment below". Do not make any comments on this topic, and the entire topic will be skipped from your submission. 3. If you don't know your electorate, choose "Don't know" from the drop-down list. Note: Do not provide a false name or a false email address: you're sending a letter to our Federal Government and its Ministers, and your letter will be looked at as an expression of you as an elector. This e-campaign has been closed, but please feel free to explore the page! I'm writing you about Australia's climate change policies, because I am deeply concerned about the future of our planet, not just for myself, but even more importantly, for Australia's children and future generations, because they will be more seriously affected than us by climate change impacts. 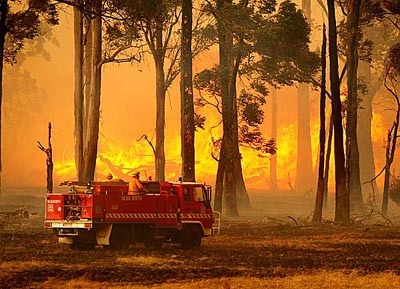 Australians are only just starting to come to terms with the devastating Victorian bushfires which 'exploded' on what was Victoria's "hottest ever" day of 48 degrees Celsius. While not so long ago it would have been offensive to frame the event in this way, it now can no longer be labelled as "sensational" to describe the terrible events in Victoria also as "a major climate change event disaster". Climate change is no longer something that happens in the future, or something that happens "elsewhere", but it is with us, here and now, and our population is deeply affected. That's why I count on you all taking my message to you as urgent and extremely important. I am deeply embarrassed about your whimpering in setting Australia's carbon reduction targets between 5% and 15%. My disagreement with these targets should not surprise you: the most eminent scientists who told the world about climate change have been critical about these targets: Former United States vice-president Al Gore, the head of the UN's Nobel-winning scientific panel, Dr Rajendra Pachauri, and the former World Bank chief Nicholas Stern; while Prof James Hansen, NASA's Goddard Institute for Space Studies, wrote an open letter expressing his concerns about Australia to US President Barack Obama. Australia should commit itself to an absolute minimum cut of 25% - to grow to 40% - of 2000 levels by 2020 as part of a firm commitment to stabilise carbon dioxide at a level between 350 to 450 parts per million. The establishment of your tiny targets combined with your enormous subsidies to the polluting coal- and other companies will make it nearly impossible to transform Australia's polluting carbon economy into a thriving post-carbon economy over the next decade and beyond. I also do not support any delay in the establishment of Australia's carbon reduction targets to a later date, no matter how massive the pressure will be on your government to do so. Australia needs to stop using coal - factually one of the world's worst pulluting widely used fuels - to power its energy industry. You know this very well, or perhaps, as our Prime Minister, you "ought to" know this very well. And, perhaps the most difficult thing during your time as our Prime Minister will be, that you need to tell the coal mining industry that it needs to shut down - shut down and close forever. I think you know this too. Exporting millions of tons of our coal to countries like China - so they then become the world's worst polluters, while the rest of makes climate change policies, may make Australia into a nation that evokes the world community's deep-seated ire. In the eyes of many critical experts, clean coal is an entirely unproven technology, and in the view of many others, it's even worse: it's a "furphy", created by the polluters and brought to national leaders in an effort to spin the wool over their eyes. Right now, it's not OK to use coal in Australia to make our electricity, and very, very soon, coal should no longer be mined and exported. I don't think it's OK, that if I would generate my own electricity through solar cells on my roof, or through other means, that the polluter - my electricity company or others - should benefit from that by getting the electricity I don't use without paying me for that, and even getting some carbon credit increases for that. At the moment only the ACT and Western Australia have "gross feed-in tariffs", where the solar panel owner gets paid a prime rate for producing power that goes back into the electricity grid when it's not used by the household. Please urgently enact national gross feed-in tariff laws that give me my decent pay for making electricity for Australia, and please stop any laws or regulations anywhere that see other companies or the State benefit when I help Australia make clean power from the sun - and make these laws also work for industry and businesses. Australia's climate change policies, as well as your consultations with what appears to be only "certain" lobby groups and the exclusion of others, are extremely concerning. At the April 2008 Canberra 2020 Summit's climate change section, Australia's powerful mining companies and coal producers were fully represented while you did not invite more than one or two people from amongst the hundreds of sustainability organisations - not even the State-based agencies. Your "high-level energy policy consultative committee until 2030" is almost brutally stacked by the powerful "old-style polluting companies" through representatives of Shell, Rio Tinto, Xstrata Coal, BHP Billiton, Santos, Woodside Petroleum, AGL, Origin Energy, the Energy Supply Association of Australia and the Australian Petroleum Production & Exploration Association. During the February 1-3 2009 Canberra Climate Action Summit you have clearly been able to observe the rising fury of people from all around the country, when more than 150 groups and organisations condemned your Emission Trading Scheme. I urge you to make major changes to your policies, not just in formulation, but also in the spirit of your national mandate, in your consultations and choice of stakeholders, and in your underlying principles. It seems you have not listened to the voice of the people. Please start doing this, fully, and from now onwards.